I'd love to see the LRP fleet start getting a little more involved in the picture you're talking about here too, Cdn CPFs, SSKs, MH and LRPAs working and training together. I know, I'm dreaming. If the Russians keep putting more and more subs in the North Atlantic, you may get your dream EITS. As I have said before, during the Cold War, I don't know a single CO who didn't say a quiet prayer of thanks to the Sea Gods whenever we had MPA flying in support. Some type of helicopter assault ship would have a number of possible missions from ASW to humanitarian. It would be a good to have on the tool belt. Agreed. Getting something like the Izumo would propel us back into the carrier business, give us a forward strike platform for whenever we get the F-35 and allow us to have a base ship for infantry assaults. The crew compliment beyond the embarked troops is only double a CPF. I'd also say a quiet prayer to have the number of VP aircraft and crews we had back then, too. And...the endurance the Argus had. The west coast has the range, so at least those crews (both MH and LRP) get some co-op time semi-regularly. I'm surprised that the east coast folks don't use it at least once a year. With regards to the two different types of helicopters that various other forces use, they seem to use one as an ASW asset and the other as an anti surface asset. It seems from comments here and elsewhere that the Cyclone's sensor suite easily supports both roles but I have not seen anything about the weapons suite for the Cyclone. Anyone know if the Cyclone's have the same sort of anti surface capabilities (specifically air to surface missiles/rockets etc) as say the Wildcats that the RN is using? It doesn't; a Stand Off Surface Weapon has been *discussed* for quite some time but was not a requirement for the Cyclone. The issues of storage, handling, and launch of an armed helicopter shouldn't be underestimated; they would need to be overcome regardless of whether it was a Cyclone or a second helo. I echo the statements of other's regarding a second helo; 12 Wing has a challenge over the next few years to generate dets for one helo. The requirements for the Cyclone were specifically set out in order that one helo would not just be able to conduct the three primary missions (ASW, ASuW, and supporting air operations ie SAR, utility, etc) without significant re-role, but to be able to concurrently do them or switch while airborne. The only divergence from that is if the aircraft is in the utility config with the mission kit largely removed and 22 troop seats fitted; this config was not in the original requirements but was added afterwards to exploit the capabilities of the aircraft, including the fact it has a tail ramp which most (possibly all, but I'm not doing the research) Maritime Helicopters do not have (not to be confused with Littoral Maneuver or "Marine" helicopters). Do the issues and challenges surrounding the storage, handling, and launch of an armed helicopter change much based on the munitions load out? If the airframe and ship and crews are setup to mange those issues for the Mk46 (as an example) is it a fairly easy process (conceptually/logistically perhaps not administratively) to manage those same issues for stand off surface weapons? Honestly at this point I am starting to think that flexibility (which is what I think most people are ultimately trying to achieve with talk of a second helo) with almost all our platforms comes from the munitions load outs that are possible, backed by the sensor and C2 capabilities to employ the different munitions types. What's lacking seems to be the munitions diversity needed for that flexibility. Absolutely, and well understood by the right people. The sensor capabilities are already there, the C2 is manageable, the flight deck procedures already exist amongst our allies; as always, what's missing is *will* and *money*. To be honest, I agree that the Merlin / Wildcat or SH-60R / SH-60S pairings bring something extra to the fight; one as the sensor banging away and emitting, one as the shooter being really, really sneaky. But, less *will* and less *money* for that exists in Canada, plus all of the issues already spoken to of building up, in effect, a whole new community. Come to think of it, given the MQ-8C endurance is over 12 hours (amazing what getting rid 3 sets of self loading baggage plus their special needs, like seats, and replacing it with go-go juice will do), and the Osprey is the first real Airborne Surface Search AESA, plus Link-16 in addition to the existing TCDL, this is where the discussion logically goes next. Give it an ESM and it could be the persistent surface search platform, plus fulfill the AEW role Underway speaks to, for countries that can't have either E-2Ds or Merlin Crowsnest. I'm sure there will be tons of discussions during the VDQ sail and "lessons learned" stuff both during and after they get back. Even before they left I've heard some great things. VDQ is doing some stuff combined with ships sensors and the Cyclone that no one in the RCN has done yet. Not to mention they have a third MASS launcher. They are really taking the ball down the field hard from what I can tell with my limited view. Jokes aside, it's just the natural friction when elements who have never worked together start working out the kinks. I drool at the potential this line of development is demonstrating. The increase in SA could be in the orders of magnitude better just by adding two of these to a 4 ship TG. An AEW variant could give a ship valuable minutes in dealing with a missile attack. Given that the fastest missiles out there could conceivably allow a ship 30 seconds to respond from detection to impact, an extra 30 seconds lead time is gold for the ship to take countermeasures. The Osprey is the first lightweight AESA maritime radar... I'm not sure that in the fullness of time you would need an AEW variant. I think a muture concurrent multi-mode radar could probably manage both surface and air search and tracking at the same time... the trick would be operationally optimizing the dwell for each. I am interested in the Link-16 on the MQ-8C... I wonder if it allows remoting of the Link via TCDL, and let the ship go silent? I agree. AESA are generally flexible enough. I wouldn't be surprised if the Osprey radar can already detect sea skimming targets with software to look for that sort of thing. Volume search AEW is probably not possible though. But over the horizon sea skimming AEW is really where you want to look for ship defence, as the ships volume air search can generally get the range for air targets above the horizon, at least in a self defence capacity. Comms is not my strongest subject but Link 16 has its own Tx/Rx system. I don't know if you can use the Link itself to remote into a UAV and access control functions of the Link. I think it would most likely need the TCDL to do that, as that's the function of the TCDL. You could most definitely set parameters before launch and just listen to Link tell you all it knows from the UAV, and the ship goes silent when she needs too. Editted to add: the same thing would be possible with the Block IV Aurora, but to my knowledge they aren't planning for it. In that case you wouldn't use the Aurora as a remote terminal, it would be forwarding via JREAP over TCDL. You *could* also use it's SATCOM data to provide a TCDL network connection for other users to the warfighter networks. Ah! I demonstrate my ignorance! I understand what you are saying. I could only speculate as to whether or not they intend to do such a thing, I suppose it depends on the tactical application of the Fire Scout and the LCS. It seems like that's one of those things that gets looked at perhaps later for future models of the Fire Scout. Considering how fast a task group likely moves, I wonder if a large part solar powered UAV managed from elsewhere might be able to sit far above the task force and provide information? Don't give them any ideas! Next thing you know, the Block 4 will be "BACN-lite"
Out of curiosity, since this thread has become fairly drone centric, does anyone know what made PUMA a more desirable fit than the S-100? I thought the VTOL characteristics of a rotary would’ve made it ideal to operate off any vessel, but particularly one with low deck space like an MCDV. And also, did the CCG proceed with a procurement for it after their trial? Mods - perhaps a thread split? Or maybe something lighter than air? However, instead of reinventing the wheel, is it better to use the already existing MQ-4C Triton (which is what the Aussies decided); it already has all the core sensors for a high altitude (50,000 feet +) platform: MFAS AESA Radar, multi-spectral EO, ESM, and AIS plus the SATCOM, TCDL (for sensor download to cooperating units) and Link-16 (harder to get info for but implied) https://www.northropgrumman.com/Capabilities/Triton/Documents/pageDocuments/Triton_data_sheet.pdf. Instead of trying to support the 24/7 persistent capability afloat you provide it from ashore... does need FOBs so might be more difficult for deployed ops for Canada? The potential of the radar is eye-watering (https://slideplayer.com/slide/1460197/). The range of the Triton is such that for Australia at least, they're looking at the MOB in Adelaide and a FOB in Tindal, NT to cover their entire AOR. 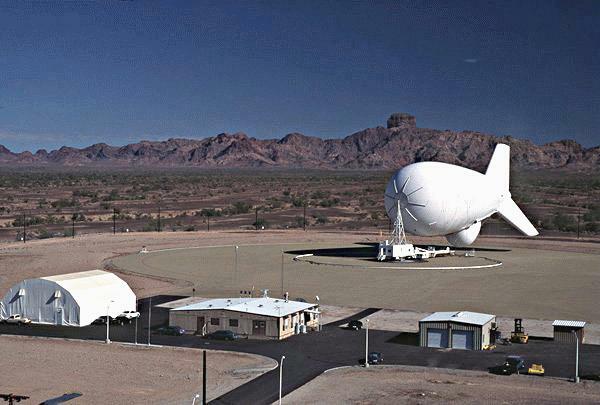 The Border Patrol still operates the Tethered Aerostat Radar System for air interdiction of drug planes. Have you seen a Puma launch? You throw it into the wind. With the Mk 1 Arm launching system. Deck space isn't an issue. No, I get that. It was the recovery I was wondering about.